Palm Avenue 2 by Rosse Immobilien Co.,Ltd. as well as internal funding (50% EC, 4.9%, 60 months). 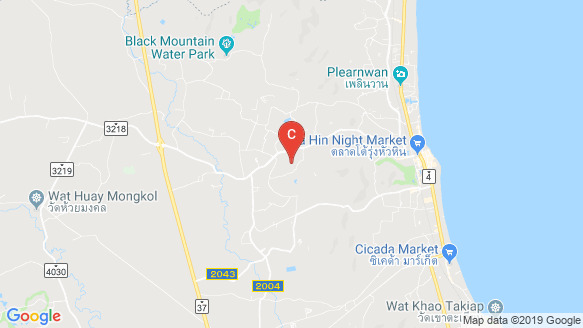 Location, Location ... it´s a short walk of only 500 meters to the restaurants and shops of the Huyal Monkhol Main Road, or a 5.5 km relaxed drive to the Hua Hin Clocktower. Palm Avenue is adjacent to Pineapple Fields, with a nice Mountain View. Palm Avenue 1 will be complete in September 2019 and offers a beautiful tiled private road, surrounded by palms and beautiful flowers. This Village of 22 luxury Poolvillas offers a comfort that is rare to find. Services include a 24-hr security, administrative office, house keeping, handy men, garden and pool service. There are Villas for rent in Palm Avenue, which is a good opportunity to enjoy holidays, and to get to know the comfort and quality of build. Palm Avenue 2 was launched in November 2018. The Villas of Palm Avenue are well designed; each villa has a shady terrace provided, tropical planted garden with a private swimming pool and first class construction quality. 19 Plots are available from 404 sqm to 803 sqm, and 8 pre-designed Villas from 187 sqm to 263 sqm of living space. The Architect is flexible, and the design can be customized, or a completely new design can be created on request.